Hi PISO FARE friends! 2 months more and the year 2016 will be bidding goodbye, yet the Cebu Pacific promo deals 2016-2017 is far from over. Check the new Cebu Pacific promo fare to domestic and international destinations. Fly from Cebu to Boracay (Kalibo), Clark, Ozamiz or Zamboanga for only P999. Trips from Manila to select Luzon and Visayas routes is as low as P1,299. All Cebu Pacific quoted fares are good for one-way trip and include the base fare, Web Admin Fee, taxes and fees as well as free 7 kilos hand carry baggage. As for the international trips, Hongkong flights from Manila, Cebu or Clark is only P1,699 while Singapore trips is as low as P1,999. Other Asian destinations are also on sale. The latest Cebu Pacific promo fares are valid for travel for November 15-30, Deecember 2016 and January, February and March 2017. Booking for the sale tickets is ongoing until October 24. Book your promo fares now! Cebu Pacific sale flights are limited and subject to seat availability! If ever you have plans to travel and your desired travel destination is not included in the advertised promo, it is best to do trial booking online to check for other Cebu Pacific low fares. Go to your favorite travel agency of ticketing outlet and buy the Cebu Pacific promo fare tickets from them. Booking online at www.cebupacificair.com. No Promo Code needed when booking. You can do this anytime of the day at your utmost convenience. Reserve the Cebu Pacific low fares via the airline’s hotline at (02) 7020 888 (Manila) or (032) 230 8888 (Cebu). For any inquiry, you may also call Cebu Pacific hotline at the above mentioned phone numbers. For passengers’ convenience, availing of Prepaid Baggage Allowance for checked baggage, flight changes and self-check-in services can be done up to 4 hours prior to scheduled flight via Manage Booking section of online booking. 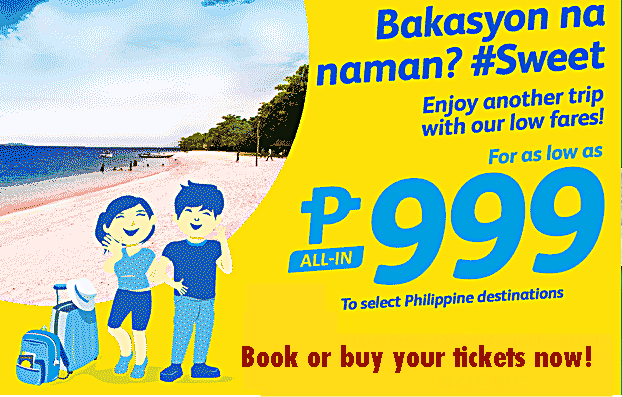 Book or buy your Cebu Pacific sale tickets now! Promo seats are limited and on a first come, first serve basis! For more Cebu Pacific, Air Asia, Philippine Airlines and Skyjet promo fares, PISO FARE and travel tips LIKE and FOLLOW us in Facebook: PISO FARE Tickets!! !